I’m teaching my annual class in Principles and Practice of Voicing the Guitar again this coming November, from the seventh through the thirteenth. I have one place left in it, in case any of you has been thinking of taking a class like this. This is a seven-day, and very hands-on, intensive. It contains a huge amount of useful information about how the guitar in its various forms works — through the prism of forty years of my own practical, hands-on experience, as well as my thinking about the what the soundbox is all about. In brief, it covers basic principles of structure and acoustics that are well known to every engineer and physicist — but they are presented in everyday language, and with common-sense examples of the things that engineers and physicists would ordinarily be talking about. These are real eye-openers (and ear-openers) to guitar makers, because they have never been exposed to the kind of information that examines and explains the relationship between structure (i.e., all the things one can do to make and shape the soundbox) and sound. These principles are not all that hard to grasp. The challenging part is learning to translate and apply them with different emphasis as would be most appropriate to the kind, size, shape, steel or nylon string, etc. of guitar the student is most interested in making. The voicing class developed into its present form over time. I taught conventional guitar making classes for many years. Eventually a lot of other people offered the same service and I withdrew from teaching the basics. Then about fifteen years ago the American School of Lutherie in Healdsburg asked me to teach a class in voicing the guitar… so I organized a five day class for that purpose. It went amazingly well. And I realized that this level of instruction is entirely missing from the landscape. So I taught it again. Eventually this expanded into a seven day class that is entirely unique and whose time has definitely come. Eventually I imagine that others will teach this too, or at least their version of it. But for the time being, this is it. It’s an enormously informative and useful learning experience. 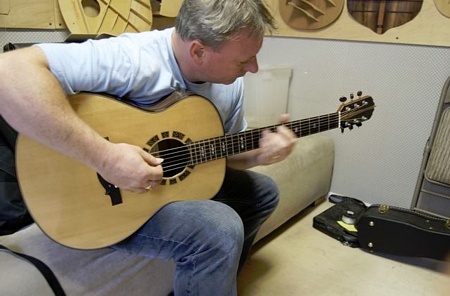 It is not a class about the mechanics of how to build a guitar, however: it is a class about how to bring out the guitar’s voice, and it’s assumed that one knows the basics about how to assemble the soundbox. Tony McManus came through Berkeley on tour and stopped by my shop, where we spent a morning together. This picture was taken in my classroom and you can see a few of the two dozen or so guitar tops and backs and assorted guitar parts that hang all over two of the walls. This is where I teach my classes and do my consultations: the room is full of visual aids and models of the various guitar-related things that my students, clients, and I can talk about. It’s great to have actual examples of things to refer to, examine, compare, and tap on, when words fail. And words certainly fail when it comes to Tony’s awesome musical chops.